Young Gifted and Black: Parents Petition to Block audio/visual of grisly crime scene in Sandy Hook. Parents Petition to Block audio/visual of grisly crime scene in Sandy Hook. In the world of sensationalism and shock value, do the public really need more? I hope these grieving parents' petition is heard and respected, let them be able to heal, this was a tragedy for the nation, indeed. 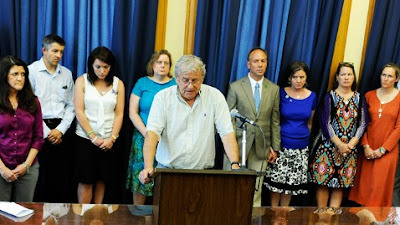 VIA: (abc.com) Parents of Sandy Hook massacre victims are petitioning the state of Connecticut to prevent the public release of graphic photos and audio taken of the tragic school shooting in Newtown, Conn.
Nicole and her husband Ian Hockley, Mark and Jackie Barden, and Jimmy Greene and Nelba Marquez-Greene filed the petition on the website www.change.org on June 1. They are all parents of children who were murdered when Adam Lanza, 20, opened fire in Sandy Hook Elementary School on Dec. 14, 2012, killing 20 children six adults. Hockley started the petition after receiving calls from political groups asking for crime scene images and recordings taken by investigators. For Hockley, the issue is not just about privacy, but also public safety. “We worry about copycat killers and the traumatic effect the material could have on people. Veteran first responders who saw what happened were completely traumatized,” she said. Moore wrote on his website on March 13, “I believe someone in Newtown, Connecticut – a grieving parent, an upset law enforcement officer, a citizen who has seen enough of this carnage in our country – somebody, someday soon, is going to leak the crime scene photos of the Sandy Hook Elementary School massacre. Hockley is not convinced. “I am active in gun safety. I would certainly never use pictures of my son to further any gun control policy,” she said. Moore state today that he does not condone releasing the material without the consent of victims’ families. “For the record: I oppose releasing any crime scene photos from the Newtown massacre without the parent’s permission,” Moore stated on his Twitter page. “My point was, should a parent decide to do this, the horror of it would be enough to encourage every American to fix this problem,” he continued. Hockley is looking to get as many signatures as possible to get the attention of Connecticut Governor Dannel Malloy. In my own opinion, I agree with the parents, I think the photos deserve to be hidden or destroyed forever.